Whether you’re a beginner cook or just a busy person, you’ve probably got a roster of dishes that you cook on a regular basis. They’re tried, tested and true. But, boy, do they get boring after a while! Rather than starting from scratch, try tweaking standard dishes by adding and experimenting with new flavors. There are many healthy, low or no-calorie ways to add a fresh twist to your meals. Here are 7 quick flavor boosters to keep on hand. 1. Fresh herbs: In the produce section of the grocery store, you’ll find bunches of fresh herbs including parsley, basil, mint, cilantro, dill, chives, sage and rosemary. A handful of chopped, fresh herbs gives a huge flavor boost to all kinds of ordinary dishes. Basil livens up pastas and pasta sauces; cilantro gives Asian and Mexican dishes that authentic kick; and mint works well in salads. Fresh parsley adds a tasty twist to something as basic as canned soup or scrambled eggs. Tips: You can use three times the amount of fresh herbs that you would dried herbs; add fresh herbs to dishes in the last few minutes of cooking. 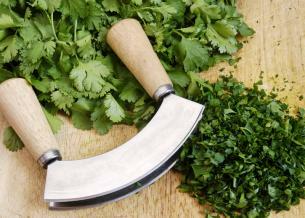 If you don’t want to let leftover fresh herbs go to waste, here’s how to freeze fresh herbs. 2. Seasoning blends, like Lawhorn’s or Mrs. Dash, are a great way to add depth and flavor without adding salt. You can substitute a seasoning blend in any recipe that calls for salt, or sprinkle it on any food that could use some zip: scrambled eggs, soups, sandwiches, salads, cooked meat or fish. You can also make your own seasoning blend. For the basics on spices, read Kathy’s post on Starting a Spice collection. 3. Worcestershire sauce, an aged blend of vinegars and seasonings, can really rev up all kinds of beef dishes. Marinate steaks in it, add it to hamburger patties, meatloaf or meatball recipes; or just sprinkle it on steamed vegetables. Another idea: splash it on some tomato soup. 4. Pickles: Before you bite into that plain old cheese sandwich, why not throw some pickles in there! Whether you like tangy dills or the bread-and-butter variety, sliced pickles make a great addition to sandwiches, burgers and wraps. They can also be chopped and added to tuna, chicken or salmon sandwich filling. 5. Cinnamon. Who doesn’t love this spice? We all know it as the key flavoring in so many desserts and baked goods, but few people think to use it in savory dishes. You can add a cinnamon stick or some ground cinnamon to soups, chilies and stews while they’re cooking. You can also steep a cinnamon stick in water to make cinnamon tea, or add ground cinnamon to coffee grounds before brewing. 6. Mustard: Try spreading mustard, rather than mayonnaise, on sandwiches. It brings lots of fat-free tang to the table, and comes in so many styles: good old ballpark yellow, hot Dijon or old-world grainy. A herbed variety, like tarragon mustard, can quickly elevate a homemade dish to restaurant level. 7. Salsa: A jar of salsa comes the rescue in almost any culinary emergency. Aside from tasting great on the tip of a nacho chip, salsa stands in as a sauce any old time. In Kathy’s Cod with Salsa recipe, for example, you just bake cod with salsa on top, creating a main dish from two ingredients. Try using it as a sauce over sautéed spinach, plain steamed vegetables, or baked potatoes. And you don’t have to stick to tomato-based versions; you can always go for corn, black bean, mango or pineapple salsa.